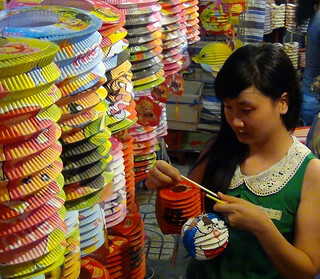 Tét Trung Thu is a traditional Vietnamese harvest festival, also known as the “Mid-Autumn Festival”. The date of Tét Trung Thu is based on the lunar calendar and this year falls on September 15. Historically this was an important time after the harvest when families would gather together and children would be given special treats. Many legends and stories are associated with this holiday, some borrowed from other Asian cultures who also celebrate this holiday. In the growing urban context some of the historical meaning of the holiday may be lost but it remains a time for special treats for children, purchasing lanterns and eating moon cakes.